Facebook (FB) shares dropped over 40% in the last half of 2018. They bounced back by about the same percentage so far this year. But as most traders know, it takes twice the return to make up for an initial loss. So, the pop in Facebook’s stock price in 2019 only returned the stock to the 50% retracement level of the 2018 decline. And it’s traded under that level for the last two months. Facebook shares continue to consolidate in a horizontal channel defined by the 38% and 50% Fibonacci levels of the 2018 decline. The 50 day moving average and t 200 day moving average are converging. The question is: What are the probable outcomes for Facebook going forward? The two most probable are, of course, breakout or breakdown from the consolidation range. 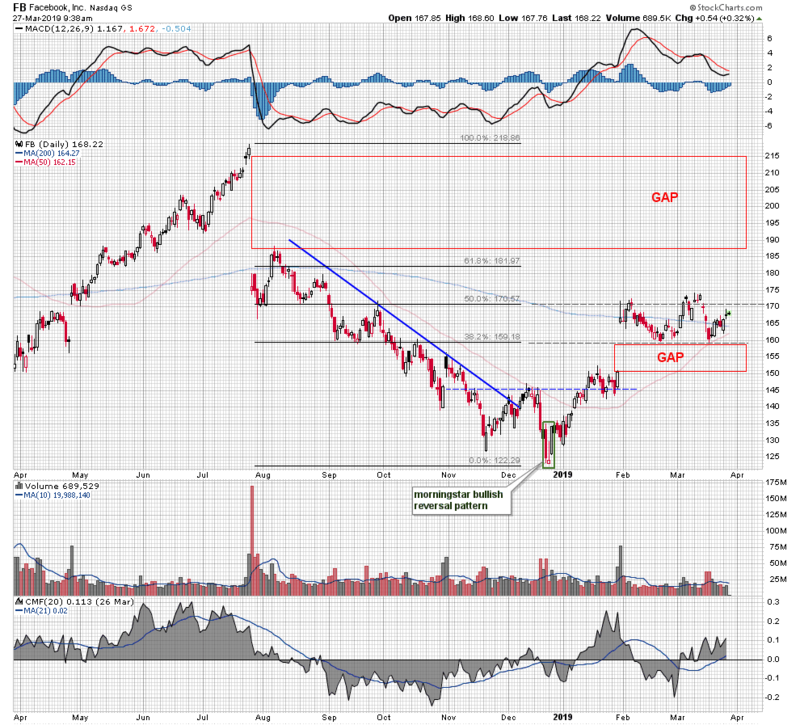 If Facebook was to make a confirmed move above the $170-$175 area, the inference would be that the stock will attempt to close the wide open gap between the $215 and $186 levels. The two month sideways action would have been simply a pause in Facebook’s upside price action that began in January. That is, a normal period of absorption and refresh in a primary bullish trend. If, on the other hand, the $160 support level gave way, the two month consolidation period might be interpreted as a head and shoulders top. 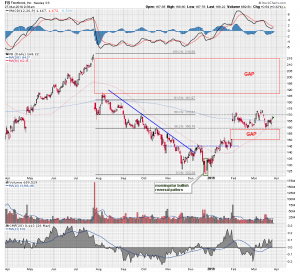 That pattern’s target price projection easily takes the stock price back down to fill the lower gap. At that point, as when any time an initial price objective is reached, the chart would have to be reevaluated. It is impossible to say with certainty what the future holds for Facebook but the integrity of the clearly defined levels of Fibonacci support and resistance, will be an early tell.